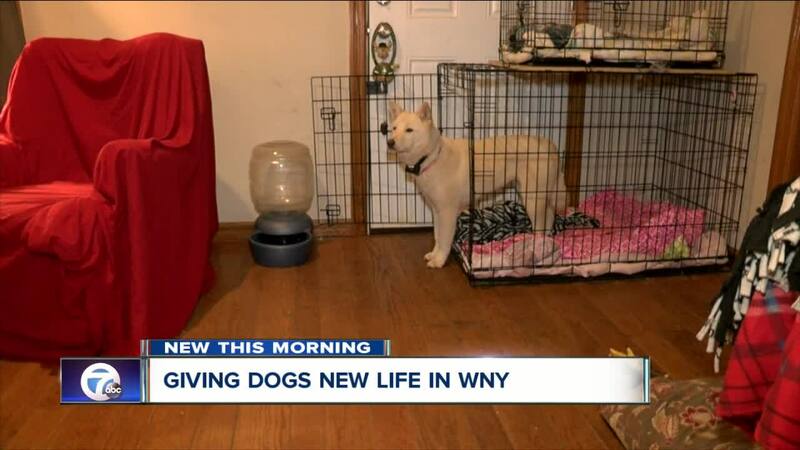 BUFFALO, N.Y. — The Silver Lining for Pit Bulls is a dog rescue that looks to give pups of all breeds a home. "We take the otherwise unwanted and that has turned into a lot of different dogs," said founder Skye Lipton. They began just taking in pit bulls, but the nonprofit has become much more. A few years ago, Silver Lining began taking in dogs from more than 6,000 miles away in South Korea, where they were to be sold in the Korean meat trade. "It's horrifying in the way that they treat them and torture them, it's horrifying" Lipton said. The dogs, which can be found on the Silver Lining Facebook page , have been through a lot. Some have lost limbs. Others have suffered intense trauma and require a special owner. "It's all about patience," Lipton said. "That's what you need to realize about it." According to foster mom Amy Schultz, who adopted one of the Korean dogs, it's the attention the dogs require that makes them so special. "A family that adopts a Korean dog, that's in their soul forever," Schultz said. "That's their dog. They know that they have saved them." Silver Lining currently has many dogs available for adoption, including multiple puppies from Korea.